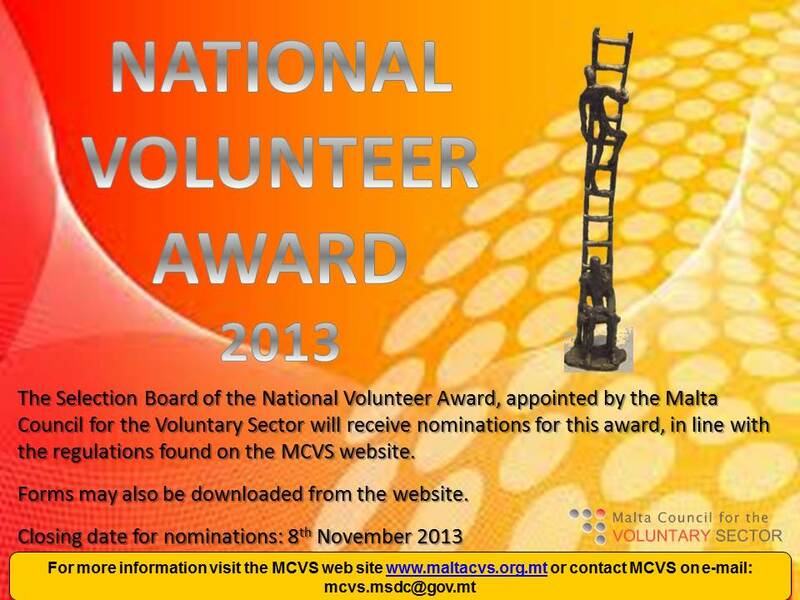 The Malta Council for the Volunteer Sector (MCVS) has launched the third edition of the National Volunteer Award to recognise the important work carried out by those who volunteer with voluntary organisations which are non profit, charities and NGOs. The award is intended to contribute towards the rewarding and recognising achievements gained in volunteering activities and the raising of awareness of the value and importance of volunteering in our society. This award we will honour those men and women of all ages who, for no material gain, dedicate themselves to help others or work for a cause. This award is also intended to further raise public awareness of the crucial role volunteers play in our society and through these role models encourage more people to volunteer. Members of the general public and organisations are being asked to nominate individuals they believe to be deserving of the award. MCVS will receive nominations on e-mail mcvs.msdc@gov.mt Nomination forms can be found in the following links: Volunteer Award 2013 – Nominationn Form (print version) or Volunteer Award 2013 – Nominationn Form (electronic) or on the MCVS web site www.maltacvs.org or requested via e-mail. The closing date for nominations is the 8th of November 2013. Further information may be requested by contacting MCVS on e-mail mcvs.msdc@gov.mt or on tel. no. 25903893. FREE AIKIDO COURSE TO THE PUBLIC!SIS Scheme 2013 – Launched!